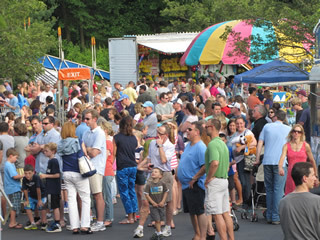 Tommy's Midway Inc. is a family operated carnival business serving South Eastern New York and New Jersey for over 30 years. The business is owned by Tommy and Madeline Murray with their three daughters. Thomas Murray originally worked with his father's carnival in Stamford, CT and Madeline Murray worked with her family's carnival in the Bronx. In keeping with family tradition, upon marriage, they started their own carnival business with just three small kiddy amusement rides. Today they have grown to an extraordinary carnival with over 50 rides and concessions for all ages. Tommy’s Midway is a member of Outdoor Amusement Business Association (OABA), International Association of Amusement Parks and Attractions (IAAPA), and International Independent Showmens Association (IISA). Tommy’s Midway provides a safe environment with a NAARSO certified inspector on site at all times. The company supplies thrilling amusement rides, intriguing games, delicious food, and fabulous entertainment for church carnivals, county festivals, and fundraising events. Rides are also available for movie, television, and party rentals.